These ads are from the September 1, 1892 Rocky Mountain Collegian. Fort Collins: The Fort Collins Municipal Railway (AKA “The Trolley”) will be running from noon – 5pm on Labor Day in addition to its usual weekend hours. 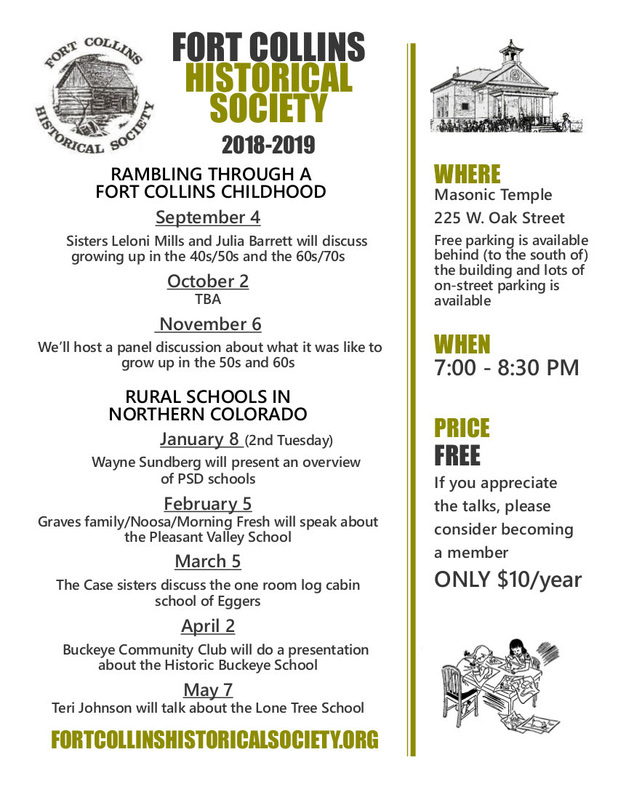 Fort Collins: The Fort Collins Historical Society kicks off the new year with a series entitled “Rambling through a Fort Collins childhood.” Join us at 7 pm on September 4th to hear sisters Leloni Mills and Julia Barrett who will tell their stories of growing up in the 40s/50s and 60s/70s respectively. Meetings are held in the Masonic Temple, 255 W. Oak Street. Parking is available on the street and behind the building. Talks are free and open to the public. Come join us as we reminisce about our Fort Collins childhoods. Windsor: Poudre Pub Talk with Teresa Funke. Bring the whole family and join us for our last Poudre Pub Talk before the Sept. 12 Party For The Poudre! It also happens to be our very first Pub Talk in Windsor! Author Teresa Funke will be joining us to read from a selection of her historical fiction works. Teresa R. Funke is the author of five books about World War II. She is the owner and president of Teresa Funke & Company and Victory House Press, which provide products and services to readers, writers, teachers, students and artists. 6- 7 pm at High Hops Brewing, 6461 CO-392. Fort Collins: The Archive is hosting a FCMoD Collection Tour from 2 – 2:30. The museum collection contains more artifacts than they could ever hope to display in exhibits. Step behind the scenes and get a special tour of the museum’s full collection. Curators will be there to show off the unseen world of Fort Collins’ past… and to answer any burning questions you might have! This program is free, however due to limited capacity registration is required. Recommended for ages 12+. Soapstone Prairie Natural Area: The City of Fort Collins Natural Areas program is hosting Smithsonian at Lindenmeier. Travel back in time to learn how Paleoindians survived the high plains and how Smithsonian Institution archaeologists uncovered their story in the 1930s. 0.25 miles; easy. Please bring sun and wind protection, water, and closed-toe shoes. 10 am – Noon. Registration required. Fort Collins: The Fort Collins Museum of Discovery is hosting Culture in the Courtyard: Auntie Stone’s Birthday Party. Ain’t no party like an Auntie Stone party! Celebrate Auntie Stone’s 207th birthday with us in her very own historic cabin. Learn the Virginia Reel dance, decorate your own brick (after all, Auntie Stone owned the first brick kiln in Fort Collins! ), and, of course, eat some birthday cake! We’ll have our 2 other historic cabins and our 1905 schoolhouse open for exploration, too! Suggested donation: $3. his program is located in the Heritage Courtyard in Library Park at 200 Matthews Street. 10 am – 1 pm. Fort Collins: The Larimer County Genealogical Society is hosting “Intermediate Genealogy Part One with Carol Stetser” from 9:30 am – 12:30 pm at the Old Town Library Community Room. Now that you’ve looked at basic records such as the census and vital records, are you wondering what to do next? Intermediate Genealogy Part One will help you advance beyond these basic records. This Part One class will teach you how to access and use the following records in depth: census records, church and government vital records, cemetery records, military records, and newspaper/obits in depth. Learn new terms such as enumerator, census schedules, baptisms vs birth, DD214, MOS, service #, sources, obits, and other esoteric terms that tend to confuse novice record users and where to find these records. This FREE, three-hour class will provide clues you’ve been looking for to take your family history to the next level. Plus we will review the databases available at Poudre River Libraries and your home. Handouts will be available. Highly recommended to have attended Introduction to Genealogy if you are a beginner before attending this class.Be sure to register for Intermediate Genealogy Part Two coming on November 17! That class will include Directories, Land Records, Passenger & Naturalization Records, Court Records, DNA, and Lineage & Ethnic Societies in our area. Wellington: The Larimer County Genealogical Society is also hosting “Introduction to Genealogy” at the Wellington Public Library from 9:30 am – 12:30 pm. Join us for a FREE three hour beginning genelaogy class in the Board Room at the Wellington Library. New to genealogy? Genealogy instructor Karen Wente will present a FREE three hour class for new and intermediate genealogists wanting to learn how to do research, types of records, where records are located, genealogy websites, recording your data, different types of genealogy software, local genealogy sources, various local societies to consider, and info on Larimer County Genealogical Society. Karen is an instructor at Larimer County Genealogical Society and has been doing research on her ancestry for over 10 years. Visitors are cordially welcome to attend and please bring a relative or friend interested in genealogy or family history! Registration is required for this class. Wiindsor: The American Historical Society of Germans from Russia is holding their quarterly dinner meeting on Saturday, September 8th from 6 – 8 pm. The speaker is Larry Bohlender who will talk about saving our records. Reservations are due 5 days in advance. Windsor Community Center, 250 N. 11th St. Cost for adults is $20; Children $10. Loveland: Colorado’s Ignominious Days Under the KKK, by Sharon Danhauer. In the 1920s a reinvigorated Klu Klux Klan membership drive in the West revived a dying organization at a time when the KKK hadn’t even entered most Coloradoans’ thoughts, much less lives, for several generations. How and why did this happen? 7 – 8 pm at the Loveland Museum/Gallery, 503 N Lincoln Ave.
Fort Collins: The Poudre Landmarks Foundation is holding a pre-tour Historic Homes Tour Architectural Panel Discussion which is ticketed separately from the tour. Speakers include local historians Barbara Fleming, Robin Stitzel, and others. Each home on the tour will be discussed, as well as a discussion of Fort Collins history, and general architectural styles & terms. Tickets are $10 and available for purchase online at poudrelandmarks.org or at the door. 7-8:30 pm at the Edwards House Manor, 402 W. Mountain Ave.
Loveland: The Northern Colorado Chapter of the Colorado Archaeological Society will hold their September meeting at the Medical Center of the Rockies, 2500 Rocky Mountain Avenue in the Big Thompson room. It is handicap accessible. Guest Speaker may be Sheila Goff NAGPRA Liaison/Curator of Archaeology History Colorado. All programs are free and open to the public. Greeley: Party for the Poudre @ the River. Celebrate the 25th Anniversary of the Poudre Trail with a look to the next 25 years. Join other lovers of the Poudre River for an informal mid-week, after-work benefit for the Poudre River Trail Corridor & Partners, The Poudre Learning Center, and Cache la Poudre National River Heritage Area! The event includes fancy foods and drink, and live entertainment by The Briana Harris Collective. Enjoy the refreshments, river program exhibits, and entertainment close to the River and in the company of others who appreciate the groups whose wonderful work on the river benefits us all. 5:30 pm. At Island Grove, 501 N 14th Ave.
Loveland: The Colorado Archaeology Society’s September Program is entitled “Dammed If We Do and Dammed If We Don’t: A Social History Of The River Basin Surveys And The Interagency Archaeological Salvage Program.” In 1944, Congress passed the Flood Control Act, which authorized the construction of a system of levees and dikes, dams and reservoirs, facilities for the generation and transmission of hydropower, and irrigation projects throughout the United States. Through lobbying efforts of the archaeological community, passage had the unintended consequence of establishing the River Basin Surveys and the Interagency Archeological Salvage Program. These programs ran for almost 20 and although fifty years have passed since their heyday, their impact is still felt. These two programs shaped the future of American archaeology. Perhaps, though, the biggest impact was on the generation of archaeologists who participated in the programs, many of whom trained today’s archaeologists, including me, and have retired or passed away. This presentation is for them. The speaker is Kimball Banks, PhD., from Metcalf Archaeological Consultants, Inc. The program begins at 7 pm at the Medical Center of the Rockies in the Arapahoe Peak/Mount Meeker room. (2500 Rocky Mountain Avenue). The event is free and open to the public. Johnstown: The Johnstown Historical Society is hosting a talk by Jim Tolstrup who will be speaking on Native Plants of Colorado and Historical Uses by Native Peoples. Join Jim Tolstrup, Executive Director, High Plains Environmental Center. Jim works to promote the conservation, restoration and landscape use of native plants and is the State Horticulture and Restoration Chair for the Colorado Native Plant Society. He will be speaking on the historical uses of native plants in Colorado. Doors open at 6:30, talk begins promptly at 7. This talk will be given in the Training Room of the Johnstown Police Department (430 S Parish Avenue). Fort Collins: History Comes Alive — Meet Enos Mills. Ascend the heights of Colorado’s mountains with famed conservationist Enos Mills. In this Chautauqua style performance, author and storyteller John Stansfield will bring to life the story of Mills, who scaled Longs Peak for the first time at age 15 and was instrumental in the creation of Rocky Mountain National Park. 7 pm at the Harmony Library in the Round. Red Feather Lakes: Join Debra Hawkins and David Frydendall on the history tour of the Meadow touring sites mentioned in the book. 8:30 am – 5 pm.Contact the Red Feather Historical Society for more info. Soapstone Prairie: The City of Fort Collins Natural Areas program is hosting Natural Area: Loren Eiseley: Scientist, Poet, and Time Traveler. Experience the amazing prose and poetry of naturalist Loren Eiseley and learn about his critical archaeological discovery at the Lindenmeier site. 0.5 miles; easy. Please bring water, sun and wind protection, and closed-toe shoes. Location: Soapstone Prairie, approximately one-hour drive time from Fort Collins. Meet at the north parking Lot. 10 am – Noon. Registration is required. Fort Collins: Join us for the 34th Annual Historic Homes Tour from 10 am to 4 pm. This late-summer event opens six private residences and two historic city-owned properties to tour guests. Each private house has been exquisitely maintained by their owners to match the era and architecture of the home, with upgrades to match today’s lifestyle. This year’s tour showcases Old Town Fort Collins historic homes built between 1879 and 1960. Many styles are represented: Victorian, Craftsman, Cottage, National, and Mid-Century Modern. The city-owned 1879 Avery House and 1883 Water Works are also part of the tour. The Avery House and 2 of the private tour homes are accessible from the Mountain Avenue trolley. Guests visit the homes and travel between tour properties at their own pace and in any order. Knowledgeable docents guide attendees through each location, pointing out architectural features, historical highlights, and details about how each home has been preserved and upgraded over the years. Fort Collins: Open house at the 1883 Fort Collins Waterworks. Drop in any time between 10 am and 4 pm (same hours as the Historic Homes Tour) to check out the historic Fort Collins Waterworks property (whether you’re part of the Homes tour or not). 2005 N. Overland Trail. Berthoud: Join the Berthoud Historical Society and the Little Thompson Valley Pioneer Museum at our booth in Fickel Park during the Farmer’s Market. From 9 am to 1 pm, look for our banner, and discover some interesting facts about Berthoud’s history! Greeley: Join the Greeley History Museum for Stories Among the Stones as a staff member takes you on a tour of Linn Grove Cemetery exploring the meaning behind symbols on gravestones. Tombstones have changed in style as people’s attitudes about death have changed. Learn about these different styles, the symbols people used and what they can tell you about the person buried there while enjoying some time outside in the cemetery in true Victorian tradition. This event is free and open the public. 2 – 3:30 at Linn Grove Cemetery (1700 Cedar Ave.). Buckeye: Buckeye Community Club’s 2018 Annual Quilt and Fiber Arts Show is scheduled for the third weekend in September (September 15 &16). The theme for this year’s show is “Winter Wonderland”, thus the quilts and fiber arts items will all feature Winter designs and decorations! This event helps to support the Buckeye Community Club and the historic Buckeye School. Fort Collins: Come Pedal Along the Poudre Bike Trail while learning about the history and heritage of the Cache la Poudre River National Heritage Area. As one of only 49 National Heritage Areas in the country, participants will discover what makes this river corridor so special as Heritage Culturalist volunteers guide them along a two-hour, 4+ mile biking tour of historic and natural sites. This event is open to all skill levels. Bicycles will be provided thru Pace, Fort Collins Bike share program (https://ridepace.com/fortcollins/). If you plan on utilizing a Pace bike, it is highly recommended that you create an account in advance of the tour. Promotional codes will be issued to all registrants so that their ride is free. Helmets can be purchased at cost through Visit Fort Collins in Old Town Square. If you have your own bike and helmet, feel free to bring those instead! People interested in attending the Historic Roads conference should check out their website for more information: http://historicroads.org/. The conference will take place September 13-16 in Downtown Fort Collins. Bike tour participants can register for both the conference and the bike tour by going here. If you cannot attend the full conference but still want to do the Pedaling the Poudre bike tour, email programs@poudreheritage.org to register. A $10 donation to the Poudre Heritage Alliance (a 501c3 non-profit) is suggested but not required. A special thanks to our partners on this tour: Historic Roads, Pace, and Bike Fort Collins. 8:30 – 11 am. The Mishawaka: Wild & Scenic Rivers 50th Anniversary. The Cache la Poudre River is home to the Mishawaka Amphitheatre (13714 Poudre Canyon Rd), providing a breathtaking natural backdrop to the restaurant and venue’s day-to-day commitment to community. The Poudre is also the only waterway in Colorado to be designated “wild and scenic” by the United States government, as part of the National Wild and Scenic Rivers System created by Congress in 1968; 76 miles of the Poudre River were designated under the act in 1986. In observation of the signing of the act that preserves the Cache la Poudre and other rivers in the U.S. “in a free-flowing condition for the enjoyment of present and future generations” the Mishawaka will present a day of river education, preservation, restoration and celebration in partnership with the Coalition for the Poudre Watershed (CPRW), U.S. Forest Service Arapaho and Roosevelt National Forests, and Wildlands Restoration Volunteers (WRV). Find out more on the Poudre Heritage Alliance website. Fort Collins: The City of Fort Collins Natural Areas program is hosting Ancient People of Fossil Creek. Discover what life was like for the ancient inhabitants of the plains. Anthropologist Dr. Jason LaBelle uncovered artifacts from over 1,200 years ago at Fossil Creek Wetlands. Hear updates from the past three years of research. Location: Old Town Library Community Room 1, 201 Peterson St. 7 – 8 pm. Registration is required. Fort Collins: The Larimer County Genealogical Society presents“Locating Images of Ancestors: Putting a Face With That Name.” Gain tips and techniques for locating images of your ancestors using a wide variety of methods, repositories, and on-line sources. Andy Likens is a professor at Pikes Peak Community College and an experienced genealogist with over 35 years of active research. Collecting images of family members is one of his favorite aspects of genealogy. 6:30 – 8:30 at the Good Samaritan Society, 508 W. Trilby Road. Berthoud: If you attend the Experience Berthoud event being hosted by the Berthoud Chamber of Commerce, the Berthoud Historical Society will be giving a presentation in the afternoon on the history of Berthoud and its economic and social value to the community. Learn more at ExperienceBerthoud.com. Fort Collins / Wellington: It’s Pioneer Living Day at the Bee Family Farm! Come learn the skills of the pioneers through demonstration tables. Visit with the farm animals. Take trolley rides around the farm. Activities for adults and children alike. Bring a picnic lunch and enjoy a day at the farm. Ice cream and lemonade will be sold by the Rocky Ridge 4-H Club. $7 Adults, $5 Seniors 60+, $3 Children 3-12, under 3 are free. Greeley: The cavalry comes to Centennial Village Museum during its annual Civil War Weekend event. This Civil War Living History event allows visitors to witness a day in the life of a Civil War soldier. Each day of the event features a 1 p.m. battle reenactment and drills. Costumed reenactors will have their tents set up on the southeastern corner of the facility and are living that weekend as they would have during the Civil War—many using historic wares true to the time period. Visitors are encouraged to visit and interact with soldiers in the encampment. The event also features blacksmith, chuckwagon cooking and print shop demonstrations. 10 am – 4 pm. Centennial Village Museum – 1475 A St.
Soapstone Prairie Natural Area: The City of Fort Collins Natural Areas program is hosting Hike through the Ages. Explore with experts in geology, ecology, and history to learn how Soapstone Prairie came to be, the creatures that keep in functioning, and the homesteading and ranching history of this area. Visit several homestead ruins and hear stories about pioneer families! Please bring a lunch, sun protection, plenty of water, and closed-toe shoes! The program will include a 6-7 mile off-trail strenuous hike. Location: Soapstone Prairie Natural Area, approximately 1 hour drive time from Fort Collins. Meet at the South Parking Lot. 9 am – 3 pm. Registration is required. Red Feather Lakes: The Red Feather Historical Society presents, Save Your Photos by Gordon Nuttall. This workshop will show you how to take precautions so your cherished collection of memories is safe and sound. Natural disaster or computer crashes can strike anyone, anywhere and at any moment in time. Scanning and backing up your photo collection is vastly easier and infinitely less risky than hoping for sunny skies or fail proof computers. Learn how to use the Flip-Pal mobile scanner. Flip-Pal products will be available for purchase as a fundraiser for the RFHS. 1 – 2:30 pm. POA building. Fort Collins: The Larimer County Genealogical Society is presenting Introduction to Genetic Genealogy and DNA Testing at the Harmony Library community room. 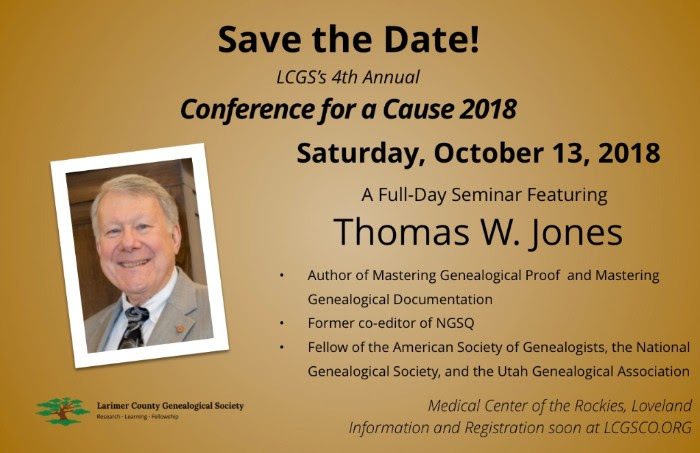 This presentation will discuss DNA testing and how the different tests can be used as additional tools in your genealogy toolbox. We will cover the main testing companies and the main tests used in genealogy research. We will discuss the best tests to use to solve different genealogy challenges. 9:30 am – 12:30 pm. This class is FREE, but you must register online. Fort Collins / CSU: Avenir Museum – UCA 10th Anniversary Celebration Open House. The Avenir Museum of Design and Merchandising is proud to have been an original part of the University Center for the Arts since its 2008 inception! Celebrate the museum’s historic apparel and textiles at this special open house and see how closely they link to the realms of music, theatre, dance, and the fine arts. Try your hand at textile skills such as weaving, stitching, and sewing, and enjoy a fascinating, event-only display of the many different types of mannequins the museum uses in its presentation of historic clothing and textiles of many cultures. For example, the body shape of 1850 is very different from 1950, and Peru is a long, long way from Uzbekistan – we’ll explain how and why the mannequin matters! 1 – 3 pm at the Avenir Museum, 216 E Lake St.
Somewhere in Larimer County: The Larimer County Genealogical Society is hosting a DNA Study Group from 6 – 8:30 pm. Location and other information has yet to be announced. Greeley: Naomi Johnson will present “Jewish Community of Atwood” as part of the Historic Preservation Program’s History Brown Bag Series sponsored by Greeley’s Historic Preservation department. History Brown Bags are free afternoon events that aim to provide cultural and historical context to topics related to Historic Preservation in and around Greeley. Unless otherwise noted, all presentations are held from noon to 1 p.m. at the Greeley History Museum, 714 8th St., on the fourth Thursday of the month from January through October. For more information about the Historic Preservation program, visit GreeleyGov.com/HP or call 970-350-9222. Noon to 1 pm. Fort Collins: The Fort Collins Museum of Discovery is hosting their once a year fundraiser. Night at the Museum: Moon Landings & Martinis, sponsored by Foundations Counseling, is a stunning 60s mod-themed evening full of unique experiences, a fab silent auction, dancing, dining, and impactful giving. This is the museum’s only annual fundraising event, so cool cats – get your tickets early and prepare to have a blast! Ticktets are $75 VIP / $55 general / $45 member price. Start time: 6:30pm for VIP / 7:00pm. All proceeds from the evening benefit the museum’s mission to create meaningful opportunities to learn, reflect, and have fun through hands-on and collections-based explorations in science and culture. Loveland: The Larimer County Genealogical Society is hosting “Researching Your Genealogy on the Internet with Bob Larson” at the Loveland Public Library iLearn Lab from 9:30 am – 12:30 pm. Researching Your Genealogy on the Internet is presented by Bob Larson, instructor for Larimer County Genealogical Society. This is a FREE three hour class comprised of one and ½ hours using three Internet databases including Ancestry’s Library Edition, World Vital Records, and FamilySearch. Bob will provide information on accessing the databases, how to use the databases in researching your ancestors, how to save the genealogy records for future use, how to build a family tree, and how to use the three popular message boards. After the presentation, the society genealogists will be available for 1 ½ hours to assist the participants in researching their ancestors. Please bring your ancestry notes and charts on your ancestors that you need help by our genealogists. If you’re new to genealogy, please bring your ancestry notes on birth, marriage, and death of your parents and grandparents if applicable. A folder with more information on the three databases, other popular genealogy databases, and Larimer County Genealogical Society is included. Limited to 15 seats! Register now! Livermore: The Fall Fest Dance will begin at 6 pm with a potluck. Dancing begins at 7:30. The band is Off the Clock which provides 50s, 60s, and 70s Rock and Roll. This dance is a fundraiser for the hall. Loveland/Fort Laramie: The Loveland Historical Society is hosting a bus trip to Fort Laramie, WY. Bring your friends and family on a comfortable bus trip to Fort Laramie National Historic Site. We’ll stop at the famous Oregon Trail ruts and Register Cliff near Gurnsey on the way to the fort. Pack your own picnic lunch. A Ranger will talk to us at the Visitors’ Center about the history of the fort, then several guides will help us explore the grounds with 12 restored buildings and several ruins. Check out the old fort here: https://www.nps.gov/fola/index.htm and the ruts here: https://www.nps.gov/oreg/planyourvisit/site7.htm The bus will leave the 5th St/Lincoln Ave. parking lot at 7:30am and return about 6:30 – 7pm. Seats are $35 each. RSVP (reservations required) to sadanhau@gmail.com. Mail your check with all names covered in the memo line to: LHS, PO Box 7311, Loveland, CO 80537. Please wear any name tag you may have. Coolers with ice will be available. 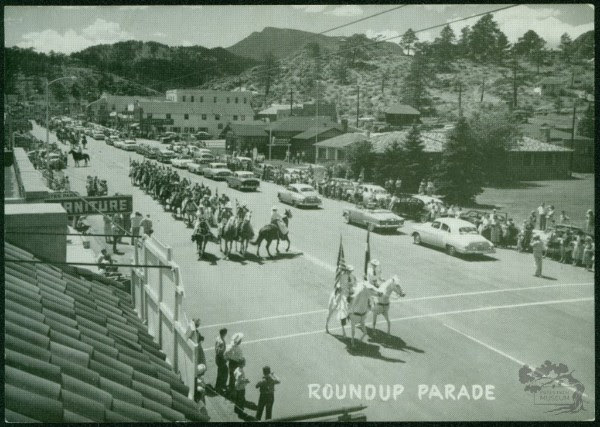 Last month to enjoy a walking tour of historic Estes Park!